Now why am I writing about this? One, because my dream is to become a practicing librarian and help children discover a love for books. Two, because this day is not going well and I need something to make me feel better and books and libraries seem to do just that. Three, I don't want to let my emotions run wild and writing this long post will help me salvage a potentially disastrous day (or weekend perhaps). So, on to the coolest libraries in America. 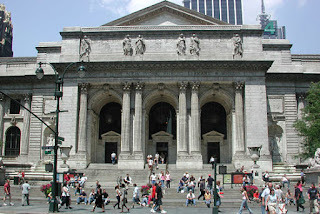 These libraries were featured on MSN and I found myself putting them on my list of places to visit before I die. There are actually 10 but I only picked those that tugged at my heaHere goes. This building is beautiful in a modern kind of way. I can just imagine how high tech their system inside is. This building just wows me with its appearance. 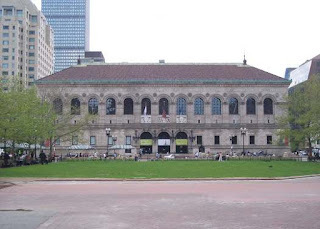 Dubbed as an example of Renaissance Revival, the Boston Public Library at Copley is "dedicated to the advancement of learning." I would sure love to learn here! 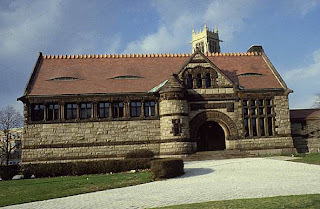 Thomas Crane Memorial Library, Quincy, Mass. This is what is called the best Village Library in all of America. Can you just imagine going there every single day and breathing in the scent of the books? I can! The facade of this building is very familiar to many, thanks to various TV shows and movies that have featured the library. Aside from the beauty of the edifice, I also like the fact that it has so much to offer in terms of content and technology. The MSN article actually described it as "WiFi technology meets century-old tradition at New York City’s famed Humanities and Social Sciences Library." Yes! Libraries are really neat places. As much as I love to search the web,there is something orgasmic about actually going into a library and smelling it, seeing it, touching a real book. And in our little rural towns, we still have pretty cool looking libraries. They always look like monuments or something. Hope your dream comes true for you. Retired - thanks for the encouragement!